Monica Benhuri is a native New Yorker and UCLA graduate who loves New York City due to its history, vibrancy, and distinct neighborhoods. She brings to Real New York her engaging personality and great taste to help her clients find their own slice of the big apple. Monica additionally prides herself in creating amicable and long lasting relationships. 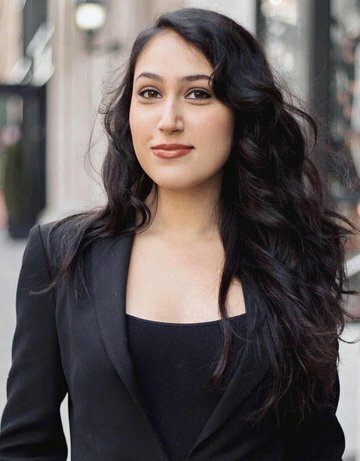 She believes that New York City buyers, sellers, and renters need to view their real estate agent as a trusted advisor. She is a valuable resource and point of contact during one of life’s most important transitions. Coming from a multi cultural background and being very well traveled, Monica speaks fluent English, Farsi and conversational Spanish - all assets which allow her to relate to both international and local clients. When she is not helping clients find their new homes, you’ll find her in the studio recording music and discovering the newest hotspots. February 2019 by Kat M.
I had personally been searching on all sorts of real estate websites, and had reached out to multiple brokers for different apartments. When I spoke with Monica, it was a completely different experience. She was super friendly, and had a genuine air about her, that made you want to work with her. I ended up having an issue getting out of my lease, and she was super happy to help, ended up renting my apartment super fast, and taking care of all of the things that would''ve been a nightmare for me to have to do. She worked with my management company, and took all the work off my shoulders of having to rent or sublease my apartment. She also was incredibly responsive, and always was quick to reply to texts, emails, and always picked up the phone when I called. I highly recommend her! February 2019 by Abigail P.
Working with Monica from RealNY was an absolute pleasure! She is professional yet personable and willing to be flexible when it comes to scheduling viewings. She showcased her extensive knowledge of the NYC market, agility to present us with new openings and transparency with all details and offerings. She was committed to finding us our new home and continues to check in periodically following our signing to ensure everything is going smoothly. I would highly recommend working with RealNY and/or Monica for your next move! February 2019 by Renee H.
Monica made this whole nightmare of a process so much easier! My plans suddenly and drastically changed the day before I was supposed to move into a two bedroom with my ex-roommate and right in the middle of a huge personal issue I was having, and Monica not only helped me find this new one bedroom that I have to myself, but she made the process so much easier and less stressful by being there every step of the way. She even went above and beyond and expressed empathy and patience listening to my story when I told her. She was great!